Of the various film festivals throughout the year, the BFF selections probably have the greatest likelihood of ending up in wider distribution. So this is a chance to see a film before most Bostonians, and some screenings will have the director and/or star in attendance. Director / Producer Justin Hunt will be in attendance. Director Alan Jacobs will be in attendance. The Globe gives a rather straightforward summary of the lineup, and The Phoenix offers more opinion to help you decide what might interest you this week. The IFF Boston folks were able to get a couple films to screen that they saw at the Toronto International Film Festival. The other two had online RSVP's, and they filled quickly. I haven't stood in one these "first-come, first-served" for a couple years, but it is true that people in the queue often exceed seats in the theatre. Check, but I believe one pass admits two people. The earlier you get there, the better chance you have to see this French romantic-comedy starring Vanessa Paradis (FYI: Johnny Depp's longtime mate, to increase your admiration/jealousy). 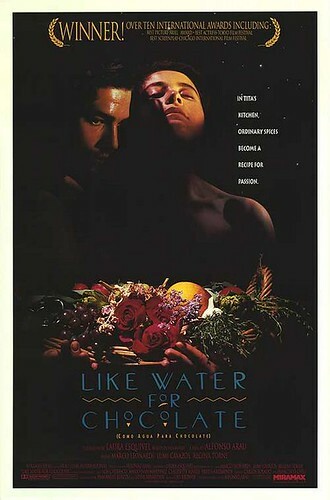 "Like Water for Chocolate / Como Agua Para Chocolate"
Presented by Food at 24 Frames per Second (there will be people waiting to let you in until 7:15pm). The funny thing is that this movie came up in conversation while my mother was visiting last week, and we both tried to describe the movie to someone. Mom plotted out the love story in 19th-century Mexico about a woman who was in true love but couldn't get married before her evil older sister. I was more interested in talking about the magical way this woman could transfer her emotions into the food she made. I remember liking it quite a bit (and probably recommending it to my mom) when I saw it. Alex Whitmore of Taza Chocolate, who I like to call the "Willy Wonka of Somerville", will introduce the film and probably bring some of his tasty treats. He's been to Mexico to learn the traditional ways of chocolate-making, and I think it's the best I've ever tasted. The Flatbread Company at Sacco's Bowl Hven seems like the best possible result of adding a pizza place to the location while retaining the candlepin bowling. I've also noticed that they want to be a good neighbor by supporting various local causes with these days where they donate a portion of the pizza proceeds -- $1.75 of each small pie and $3.50 of each large pie. In a few weeks (10/8 to 10/10), the HONK! Festival brings local street bands together with other ensembles from around the country (and a few from Italy) to make joyful noise, and buying pizza will help defray the associated costs. The HonkFest is even more amazing to me when I think that there wasn't anything quite like it before they began in '06. More than $12 and worth it if you love Canadian folkers with high, husky voices and catchy yet substantial tunes -- and who may like to rock the autoharp. Basia Bulat and her band headline a night with the sparsely compelling indie-folk of The Acorn and one of Boston's best singer-songwriters John Shade.